Yesterday was such a nice day in London, in fact the past few of days have been so nice. We've had a couple of the hottest days of the summer (I'll admit it's not really a challenge). 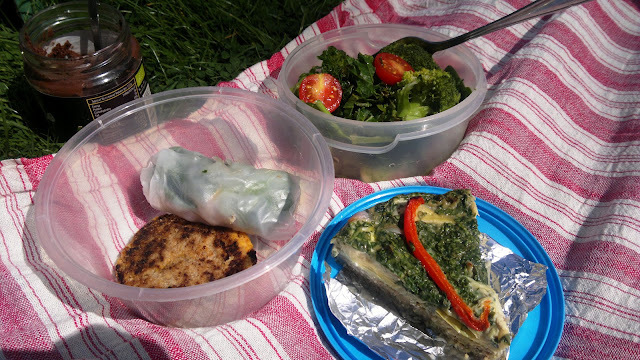 So my good friend Amy and I headed down to Richmond to get some outdoorsy-ness into us and have a little picnic in the park. The feast! 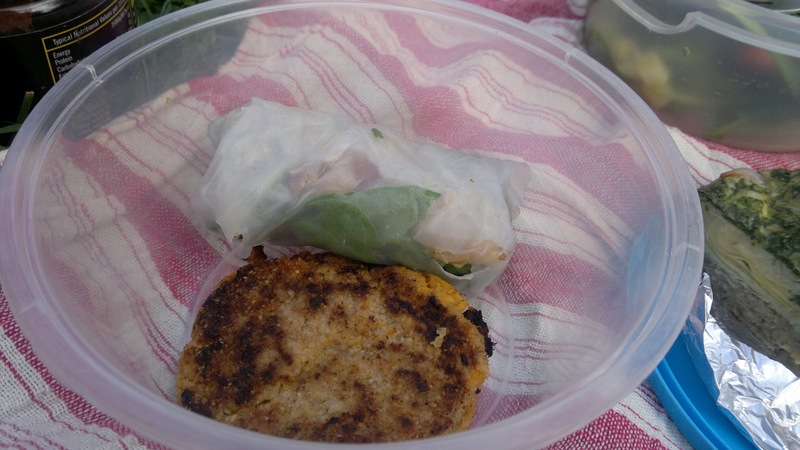 This was just my line up... On the left is a tuna and sweet potato burger and a rice paper roll with tuna and avocado. To the right is a kale, brocolli, tomato and spring onion salad. And then down the bottom is my latest creation, a lentil crust quiche. Recipe coming soon! Dessert was a work in progress I have been making for a while (but still haven't got it quite right!). 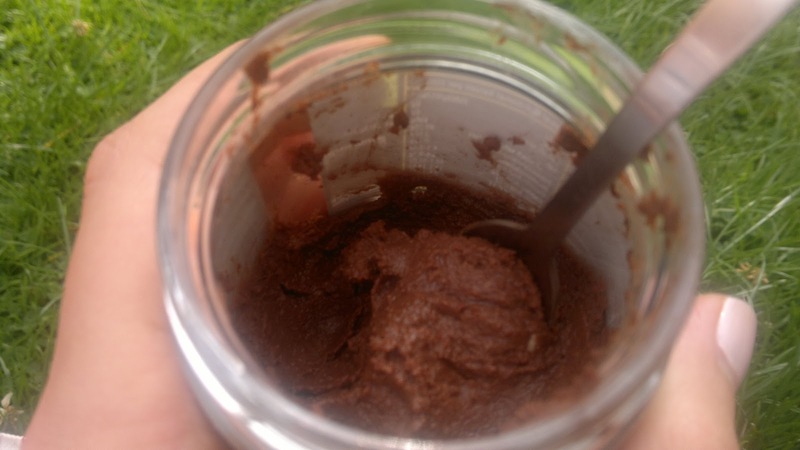 A chocolately bean based pudding. After lunch and sufficient meditating (snoozing) in the sun we were on the hunt for a nice cup of tea. We found a really sweet little cafe called Hollyhock. 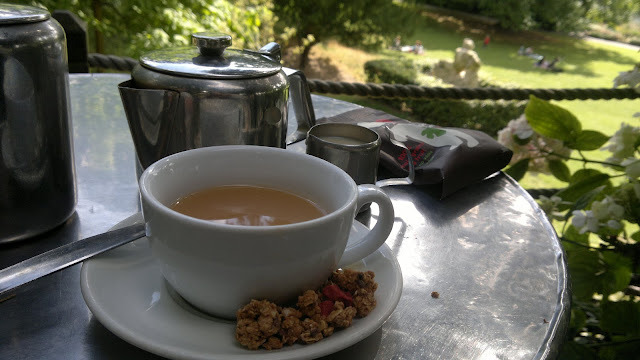 They had a nice range of herbal teas but I stuck to my trusty rooibos with a bit of soy milk. 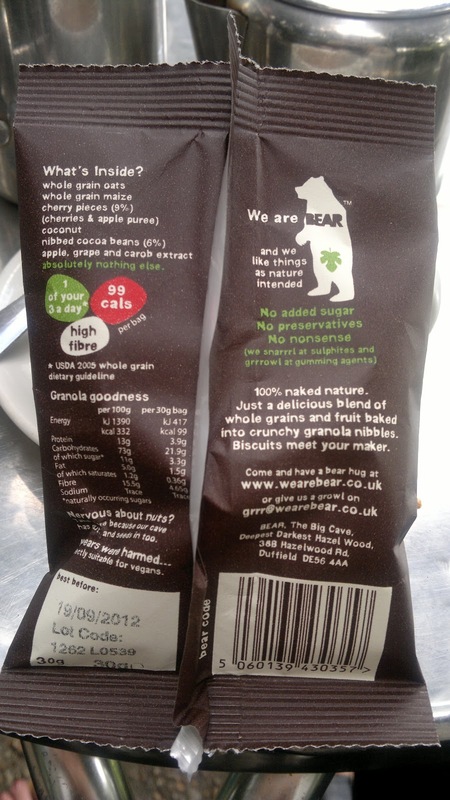 I also found a product called BEAR Nibbles Choc Cherry Granola. I've seen some of their other products before which are natural fruit snacks. I'm always intrigued when I see new products and so I picked up the granola to have a look. When I normally see granola I think sugary syrup as that's what is commonly used to stick together the little clusters of oats. Much to my surprise this granola had no added sugar or sugary syrups. It even had little cacao nibs which are just little broken up chunks of the cocoa bean. Yum! It seems I was lucky to find and try these. I am not able to find any info on the website about the granola because they have temporarily discontinued them to bring out a new and improved range. More taste testing to be done, can't wait!